6-13/16" x 14-13/16" x 4-1/2"
12" x 16" x 1"
10" x 14" x 4"
10" x 21" x 1"
Are you looking for shadow boxes that will display some mementos while still keeping them safe? 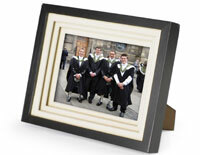 This brown or black box framing is able to do that and looks stylish too. These shadow box picture frames for militaria achievements are available in many different sizes and styles. The custom presentations are able to be personalized directly by owners so that people can show off their special memories in their home. 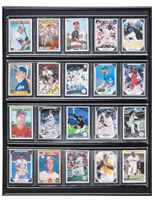 These shadow boxes, called box framing, are also used by businesses to showcase various sports pieces, examples of items, or star jerseys. The wood framing is seen in schools too for providing samples of student writing or art with the ability to keep it free of vandalism with a locking case. The home framing options are useful no matter the setting or situation. These affordable boxes are made of wood and have an appearance that lends itself to both casual and upscale photo display locations. What are some special features that this box framing might have? These shadow box picture frames feature three different finishes: black, brown, and cherry. The majority of the wood framing is made of sleek & smooth MDF as opposed to the few exceptions that are made of solid wood. Many of these display cases offer a front glass door, tempered or real, and some of them will lock tight in order to secure the photos, art, or other items inside. All of this affordable wooden box framing is designed to hang on walls, although some could be placed on tables or counters, and several of the design can also be hung in horizontal or vertical orientations. 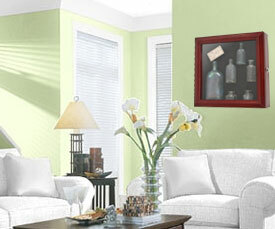 There are several examples of cases in this category and the most basic is the picture frame models. All of these frames are raised away from the mat and photo for a special look. These commercial picture displays are ideal for home use with a favorite wedding, graduation, or baby portrait in them. These frameworks are available in black or brown coloring and in several different sizes from 4" x 6" up to 16" x 20" and most of them come with a white or off-white mat for extra display possibilities. All of the frames are stylish and work well with many different photos. The majority of these military display cases are also designed only for wall mount use in portrait or landscape format; however, there is one option that is able to set on tables as well and also has a three-layer mat that really gives the appearance of a photo that is set back from the edging. These mounts are also our most affordable, but that does not mean that they skimp on quality! Another segment of this category is the basic display cases that don't lock and this is probably the most diverse part of this section. 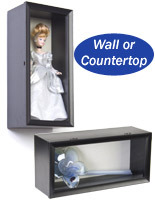 Here you will find a doll mount, a baseball card holder, and what are more traditional shadow cabinets. There are some black framing structures that have swing open glass front doors with magnetic closure or with a non-locking latch that will keep the wood display case safe, but not locked. There are also many examples of a lift off framing and these are probably the cleanest look that we offer. The shadowbox display sits directly against the wall and lifts off for access to what's inside. The front panels attach to the backers to not worry about them falling apart once hung. 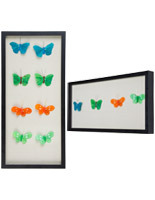 These units are ideal for creating a custom presentation of art or other important items or keepsakes. Many of these frames feature a black finish, but brown is also available. Many of these frames can be mounted in horizontal or vertical orientation, which once again adds to the ability to create a custom look! 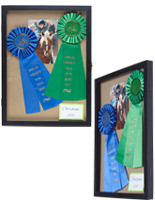 How are things typically mounted in a box framing, such as these? Well the frames that are part of this category are pretty self-explanatory: insert a picture and hang on the wall. The majority of these wall chests come with pins or Velcro® to secure items and both options should be able to hold pieces that are lightweight without an issue. 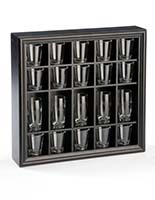 The last and largest type of wood framing available are the shadow box picture cabinets. So not only will they display treasured items in your home, but they are also great for retail use due to their extra security. Small pieces of art, baby pictures along with shoes and a lock of hair, wedding invitations and photos all these are great ways to use these casings in your residence. They come in hues and finishes of black, cherry, and brown with the possibility of removable glass shelving. 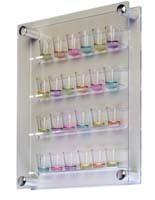 The depth of these cabinets range from 2" to 5-1/2", which makes it possible for owners to display just about anything, such as souvenir mugs or larger figurines, and still be able to secure the door. These deeper fixtures are the perfect choice for retail location that sell items that should be one display, but need to be protected while they are being showcased. 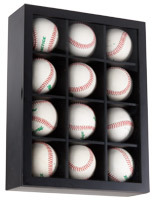 They are perfect for sports memorabilia shops or antique stores with unique items that should be placed under lock and key. These cabinets come with a set of two keys, which also limits access to those priceless goods.